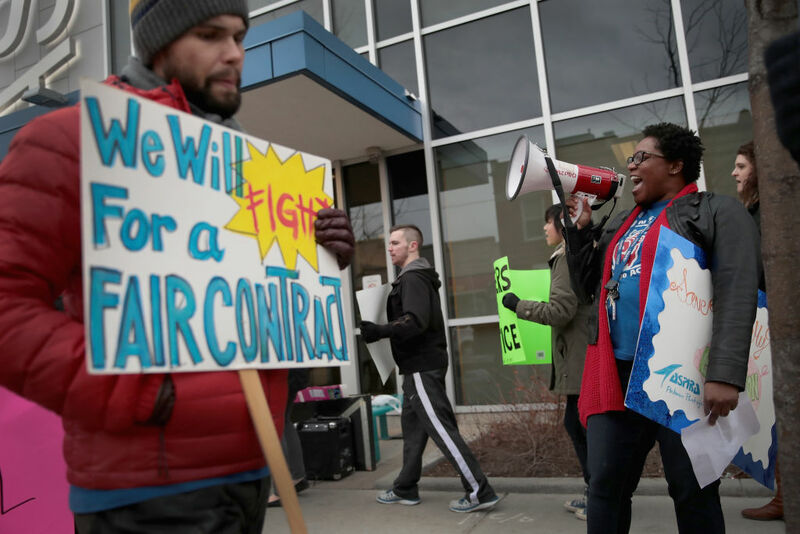 Chicago charter school educators are poised to strike. Their unionization and militant organizing show how teachers around the country can fight corporate education reform. Yesterday, 98 percent of teachers and staff in the Acero charter network in Chicago voted to authorize a strike. Acero, the largest network of unionized charter educators in the city, represents over five hundred members at nineteen schools across the city. Four schools associated with the Chicago International Charter Schools (CICS) network will take a strike-authorization vote this Friday. Contrary to most media reports, this would not be the first time charter teachers have gone on strike. In 2011, roughly two dozen teachers at Philadelphia’s Khepera charter school staged a wildcat sick-out, as former teachers union organizer Shaun Richman explained in 2016. But a strike of this kind wosaruld still be historic — the first time hundreds of charter educators across two major networks have walked off the job en masse. In the process, the union has sought to reverse the weakening power of teachers’ unions, one of organized labor’s last strongholds. By unionizing teachers at charters, CTU has wagered, elite support for charter expansion will diminish. The billionaire donors and neoliberal politicians who push for charters will no longer be able to use them as a weapon against union power. This is not the first time Chicago charter teachers have threatened to strike. In May 2017, teachers at Passages Charter School in the North Side’s Edgewater neighborhood nearly walked off the job, just two months after teachers at the UNO (now called Acero, renamed in the wake of a major corruption scandal) and ASPIRA charter school networks narrowly averted a strike. Then, as now, educators’ demands targeted the worst aspects of the corporate reform model: low wages and poor working conditions that increase staff turnover and rob students (who, like Chicago Public Schools students, are disproportionately poor and working-class students of color) of a quality learning environment. This time, contract negotiations hinge on the need for smaller class sizes, more support for special-education services, higher salaries and better benefits, and changes to working conditions. The demands include more “flexibility to revise packaged curricula that are not culturally relevant or age-appropriate” — critical in charter schools, which often mandate scripted lesson plans and test-prep instruction — and “trauma services and wrap-around supports for their overwhelmingly low-income non-white students.” The latter would signal a shift away from the “no-excuses” disciplinary model most charters adhere to, which disproportionately punishes low-income students of color. “Teacher retention at my school has been impossible,” she said, attributing the high turnover to the low pay teachers receive in charters in comparison to Chicago Public Schools. Executive pay, though, is strong. According to the union, Acero CEO Richard Rodriguez earns $260,100 to manage a system of 15 schools. (Chicago Public Schools CEO Janice Jackson makes $260,000 to oversee 513.) Meanwhile, the average Acero teacher salary is $13,600 short of the average CPS teacher. The union also points to the fact that Rahm Emanuel’s hand-picked school board has “forked over hundreds of millions of tax dollars to the privately run charter network, on top of millions more in state funding for UNO/Acero school construction.” Emanuel, who oversaw the largest number of school closings in US history, has been a vocal admirer of charter schools, especially the Noble network. Last year, the announcement of a teacher-initiated union drive at Noble signaled the potential for a major transformation of the city’s charter school landscape. While Chicago has an unusually high number of charter school unions, the Noble network would be the largest, at 800 teachers and staff. It is also unique because unlike networks like ASPIRA and Acero, which both unionized after major corruption scandals, the network has never faced allegations of financial mismanagement. To the contrary, Noble, which has been described in Crain’s Chicago Business as running “like a high performance corporation,” is the darling of billionaire politicians and philanthropists, who’ve donated vast sums of money to pay for the network’s expansion across the city. Illinois gubernatorial candidate J.B. Pritzker and incumbent governor Bruce Rauner both have Noble campuses named after them. Perhaps the most important audience would be other teachers: A strike at a charter network could put charter school organizing on the map nationally in a major way, at least in teachers’ circles. This is what happened with the 2012 CTU strike, and it’s what happened with the red-state rebellions earlier this year. Teachers around the country — like Baton Rouge teachers just last week — saw other teachers striking and winning, and realized they could too. Perhaps, in the wake of a Chicago charter strike, we’ll soon see charter teachers in other cities unionizing and striking in cities like Detroit and New Orleans, which have been the playground of the school privatizers for more than a decade. The 2018 teachers’ rebellion clearly isn’t over yet.